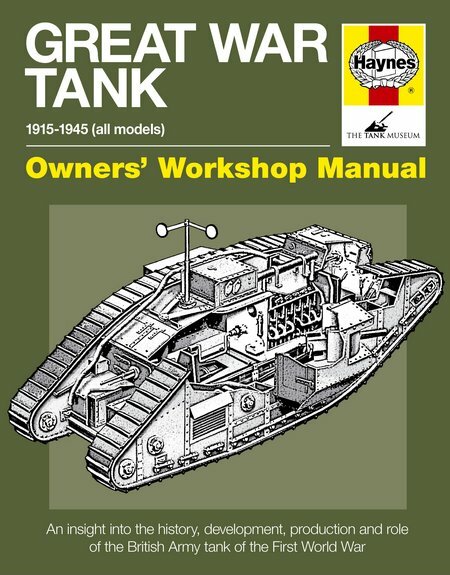 This addition to the Haynes Owners’ Workshop Manual series follows the well-tested and popular format of concise text and lavish illustration, with some outstanding technical drawings and sketches, blended with an excellent selection of photographs, some from history and others shot in full colour of display and working examples of the subject to illustrate restoration and maintenance. First British tank marks the start of a century where the tank has been king of the battlefield and is still a potent element in warfare and in controlling civil disturbance. DESCRIPTION: This addition to the Haynes Owners’ Workshop Manual series follows the well-tested and popular format of concise text and lavish illustration, with some outstanding technical drawings and sketches, blended with an excellent selection of photographs, some from history and others shot in full colour of display and working examples of the subject to illustrate restoration and maintenance. First British tank marks the start of a century where the tank has been king of the battlefield and is still a potent element in warfare and in controlling civil disturbance. There are many popular fictions relating to the ‘tank’ of the Great War. Several are credited with its invention and there are several versions of how ‘tank’ came to describe an armoured fighting vehicle. In reality, the armoured fighting vehicle dates back into ancient history. When the chariot appeared, it provided mobility on the battlefield, provided some protection for its crew, and achieved firepower on the move by allowing a driver and archer or spear thrower to attack targets, particularly infantry targets. At several points in ancient history attempts were made to build a protective shell on wheels that was moved by manpower or horsepower. These vehicles were clumsy and often failed to provide adequate protection for their crews. Most commonly, they were used to protect engineers undermining fortified walls and towers, or attempting to force a protected gate. Armoured siege towers were also widely employed to bring attackers up to a fortified wall and avoid the need for scaling ladders. The difficult task was moving the towers close enough for their bridges to reach the top of the fortified wall and that led to the towers also providing an armoured position from which archers and spear throwers could lay down suppressing fire to protect those who were moving the tower towards the wall. They were therefore mostly special task vehicles that protected a crew from attackers above them who would throw down heavy objects, spears or arrows. Where they were most vulnerable was against attack from hot or flaming fluid poured down on them. This fluid could flow under the armour with disastrous effect. The problem that defeated armoured vehicles before 1914 was the lack of all-round protection, a rugged wheel system and a suitable power source. Before 1914, tracked vehicles had been built for agriculture and as tractor vehicles for more general use in areas that lacked hard roads. Several builders claim to have devised the track as a metal road way laid beneath the vehicle’s wheels. As a continuous loop of track, the vehicle automatically laid and recovered this roadway as it moved. Before that time, the only way of laying temporary track across rough terrain was to lay rail track and recover it after the train had passed over it. This labour intensive system did permit railway rolling stock and locomotives to move across virgin territory in Africa and other areas under exploration, but it was obviously cumbersome and inferior to permanently laid track. It was unsuitable for battlefield use because the people laying and recovering track would be very vulnerable. There had already been some use of armoured trains running on permanent rail track to weakness of this system was that the enemy could either destroy the track, or avoid it, making the armoured train unsuitable for offensive use and of relatively limited use as a defensive weapon system. Where permanent rail track could not be justified, the primitive temporary track was replaced by tracked vehicles, vehicles equipped with floatation tyres, and hovercraft, as these new vehicles became available. Fixed wing aircraft and helicopters provided a further alternative by avoiding the need to travel across hostile terrain, while the use of air-dropping supplies catered for those situations where materials were needed in inaccessible locations that an aircraft could not land in. The basic challenge facing the designers of early tracked vehicles was in achieving directional control. Several early designs employed trailed wheels to turn the vehicle, but the most effective method was soon seen to be the skid-steer method of slowing or stopping one track so that the vehicle skidded on that track with the other track forcing the vehicle into a turn. Eventually, designers learned how to provide the driver with a conventional steering wheel to ease driving effort and to provide automatic gearboxes to further simplify driving. However, the half track did continue in use, with conventional wheels at the front providing steering, and the rear wheels being replaced by a short track. Many of these vehicles were armoured and were used in some numbers during WWII and in the Middle East conflicts after 1945. The author has concentrated on the Tank Mark IV, but has also traced British military history from the Hornsby Train Track Tractor trials in 1903 and envisaged as a system of moving guns and supplies across difficult terrain. The development of the tank is covered well and followed by chapters studying the anatomy of the tank, its early armament, its camouflage, paint and marking, its operation, its use in war, and the survivors. As there are only a handful of survivors, those that still exist have to be maintained in their original form and that limits any potential for extensive preservation by operation. It does not prevent examples being displayed at tank fests, but the original equipment has to be handled with great care and display is usually restricted to a slow drive past. There is some potential for building replicas, for which this manual will prove a useful aid, but a replica is likely to be an external replica that uses a modern engine and power train system. The first British tank, Little Willie, comprised two metal tracks on either side at the bottom of a very simple armoured box. It proved the basic concepts, but was soon followed by the rhomboid shape that became the classic tank shape of WWI. By placing the body of the tank between the tracks, obstacle clearance dramatically improved and the centre of gravity was lowered. This shape was carried through from the Mark I to the Mark VIII. Initially, a pair of wheels, behind the tank, assisted the directional control, but were soon deleted to rely only on the skid-steer system of varying the speed of each track. These early tanks were uncomfortable and claustrophobic, noisy, dirty and not entirely bullet proof, the crew being equipped with helmets that included chain mail to reduce injury from bullet fragments that found their way into the interior. During the Great War, various efforts were made to improve trench-crossing ability. Adding track extensions was not entirely successful because the extensions reduced track stability. The more effective system was to add rails to the top of the tank and mount heavy timbers or fascines that could be dropped into a trench to enable the tank to roll over the material to reach the other bank of the trench. The Mark IV was to prove the most numerous and successful model with more than 1200 examples being completed, and with a handful surviving to the present day, making it the obvious subject for this manual to concentrate on. The Mark VIII was the final development of the classic rhomboid tank, intended as an ‘international’, design that would have been used by Britain, the US and France, had the war continued longer. After initial introduction to service, the Germans responded by building wider trenches and the design was modified to counter this, as observed above. The main variation though was in armament. The use of a box shaped sponson on each side within the track was initially used to house 6-pounder guns and machine guns. In this form it was described as a male tank. Female tanks replaced the 6-pounders with machine guns and a flexible machine gun mount was added in front of the commander and driver. As a tank might be alone, without supporting infantry, it always faced the risk of enemy infantry close to the tank or even on top of it. This was addressed crudely by tank crews firing revolvers through small vision/firing ports. The author has reviewed anti-tank gunnery. This was based on standard guns with armour piercing bullets and the Germans rarely had an adequate supply of armour piercing rounds. The lack of similar numbers of tanks on the German side meant that the British and French had much less need for anti-tank guns and when the Germans did employ tanks, it was usually with captured British tanks rather than with their own clumsy armoured vehicles. One British response was the Boyes anti-tank rifle of .50 calibre that was rarely used, not much-loved by the infantry, but still around in 1939 when it came to be issued to LDVF volunteers for home defence. The British tank certainly made a huge impact on the stagnation of trench warfare and was a potentially effective counter to the machine gun that had resulted in the construction of trenches along the full length of the Western front. Tactics had to be developed and were restricted by a lack of sufficient numbers of serviceable tanks to take part in mass attacks on the lines of Cambrai. The British also used tanks in the Middle East, but more commonly used armoured cars, which were well-suited to conditions where cavalry moved across long distances in a fluid warfare. The author has done a very effective job and the Owners’ Manual manages to pack in a considerable amount of detail and first class illustration in support of the text. WWI military enthusiasts and those interested in army technology will find this a book not to be missed. It also provides a story of technology that many others, who may not have a strong army or war interest, will find of great interest.